STEETLEY Church is situated within the border of Derbyshire, about one-and-a-half mile from Shireoaks, and about three miles to the west of Worksop, near the Chesterfield Road. It stands a few hundred yards from the road to the north in a field, and is surrounded by trees. The name does not appear in the Domesday survey, nor is the church named in the "Valor Ecclesiasticus" of Henry VIII. Steetley was formerly a portion of the Fee of Tickhill, and was very early held by one Gley de Briton, who had four sons. Only one of them had issue, namely, three sons and a daughter, the latter of whom became heiress of the family. She was married to Robert le Vavasour, who, through her, became Lord of Steetley and Denaby, near Mexbro'. From a postmortem enquiry taken at Chesterfield, after the death of Anker Freshville, in 14 Richard II., 1391, it may be gathered that he died, seized, among other property, of one messuage and a bovate of land at Steetley, together with the advowson of the church, and that he held them of John le Vavasour by fealty for all services. The property continued long in the family of Freshville, some of whom resided at the hall near the chapel, now used as a farm-house. From that family it passed into the hands of Sir Thomas Wentworth, in the reign of Elizabeth, and from his representatives to the Earls of Shrewsbury and their descendants, the noble house of Howard, with whom it remained till, together with the Worksop Manor Estate, it was sold to the Duke of Newcastle. The date of this beautiful Norman Church, which no doubt was built by one of the Le Britons, is about 1150 or 1160. It consists of a nave and chancel, terminating in an apse, the whole being 56 feet long, divided from each other by a massive arch. The apse, which is semi-circular, is separated from the re;mainder by a second arch. The nave and chancel have long been unroofed, but the pitch of their roofs may be ascertained from the remaining gables, and the building is otherwise entire. The apse of Steetley is vaulted, and formed of rubble work, supported by moulded groins, ornamented with beakheads; at their junction is an oval medallion containing a representation of the Holy Lamb and banner. A string or band, enriched with interlacing foliage, surrounds the apse externally. The doorway is composed of three receding semi-circular arches, the first or outer one of which is ornamented by zig-zag or chevron moulding, and rests on two semi-detached columns, composed of six stones each, richly carved, with medallions, sup;posed to represent the twelve signs of the zodiac. On the outer capitals of this arch is represented the syren, a subject rarely met with in England ; and on the other a conventional ornament springing from a mask. The second arch is composed of the beakhead moulding. The shafts below are detached, and are adorned with elaborately interlaced foliage. The third or inner;most arch is simply moulded, and is supported by a pair of engaged shafts, united at the capitals. The chancel arch is a very beautiful specimen of the ornamentation in use during the 12th century. It is composed of three mouldings, the innermost of which is enriched with the chevron; the next with the embattled ornament; and the outermost one is decorated with a series of small circular arches, with a reticulated ball in the centre of each. The capitals on the north side are curiously carved with representa;tions of a two bodied lion, and of the contest of St. George and the Dragon. The only ornamentation on the inner arch is a small billet moulding, running round its external edge. The capitals in the interior of the apse are very beautiful in design—one representing the Temptation of Adam and Eve. 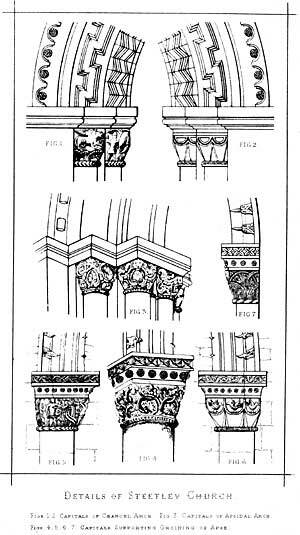 Traces of painting may still be seen upon the capitals and mouldings of the apse, as well as upon the ribs of the vaulting. In 1698-9 the Rev. A. De la Pryme wrote: "In a green meadow close in Stickley, near or in Shire Oaks, in or near Worsop, in Darbyshird, stands a staitly well- built chapel, all arch-roof'd, excellently enambled and gilt; the lead that cover'd the same is all stoln away, so that the weather begins to pierce through its fine roof, to its utter decaying." In August 1873, the British Archaeological Association held their congress at Sheffield, and this chapel was visited by the members, who expressed their extreme admiration of its architectural features. It was considered to be scarcely equalled by any other example of the kind to be found in the country.A strong representation was at the same time made, which it was desired should be conveyed to the owner of this choice relic, that in order to preserve it from the destructive effects of exposure to the weather, it should be roofed in, a work which it was stated might be effected at a very moderate expense.